Older People Can Backpack Too! It seems to be a given that the travelling community is made up of wide-eyed twentysomethings who want to travel the world, taking advice from low thirty-somethings who used to be wide-eyed twentysomethings who achieved their dream. A combination of articles like Twenty Things To Do In Your Twenties, and Thirty Places To Go Before You’re Thirty, coupled with branding/advertising that markets things like backpacker hostels, RTW tickets, and the like to those people who are, to coin a phrase, ‘young, free, and single’. Maybe there’s a feeling that once you pass a certain age-point you’re maybe assumed to be ‘too old’ to be doing this sort of thing. Maybe older people are normally assumed to be career-focussed, family-oriented, and don’t have the time or situation to go gallivanting around the world at the drop of a hat. There’s also maybe an impression that older people are ‘less fun to be around’, and ‘less interested’ in travelling to new places, preferring instead to holiday every year in the same all-inclusive villa resort just outside Benidorm or something. Travel can be as cheap or as expensive as you make it. There are many other travel bloggers out there who explain how you can go around SE Asia for less than $10/day, or how to work while you’re abroad, or how to take advantage of tricks and tips to get cheap deals and the like. All of this is good, and regardless of what your initial budget is, every single saving you can make means you can spend longer travelling. Regardless of whether you’re 20 or 60, if you backpack, the chances are your overall spend would be quite similar. 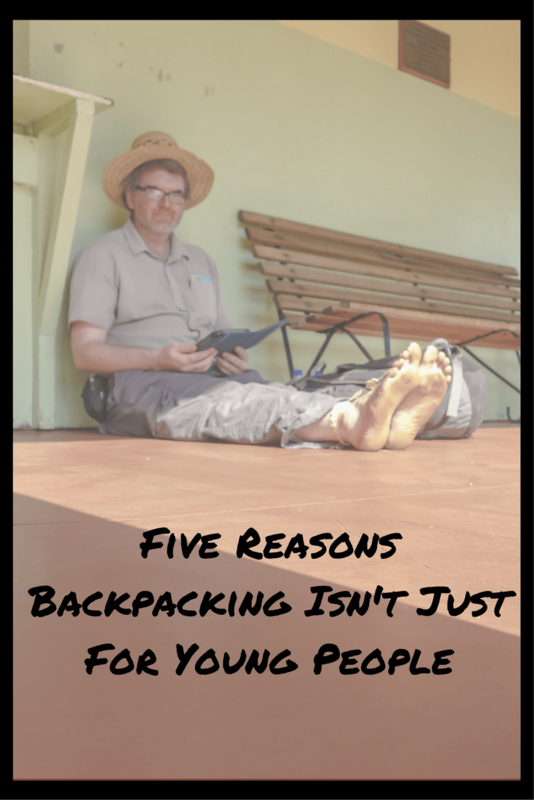 However, the advantage of being slightly older than the average backpacker means you’re more likely to have a bigger budget to begin with. It’s likely you’ll have had a job for a while, that you’ll have been able to save up a bit of cash to prepare for the trip, which means when it comes to budgeting, you’re more likely to be able to do more with it. This doesn’t mean fancier hotels, expensive restaurants, and the like (street food is cheap but isn’t that part of the reason you’re there – for the local experience?! ), but rather more (and longer) excursions to get a better feel for a place, or an ability to be more flexible in your travel plans (you can take that more expensive but considerably more convenient flight). 2) You have more of an idea where to go. Suppose you’re told from the beginning that you can take a year out of your life to travel the world, but you can only do it once, and never travel again. Where would you go? And when? Many people do their travelling before their mid-20s, before they have a career or responsibilities, and their travel destination choices reflect their lifestyle at the time – hence the popularity of both ‘existentialist soul-searching’ trips around India and ‘party party’ weeks on the beaches of Thailand and Bali. Much of the world is an unknown quantity as (in the UK at least) the history and culture of much of it isn’t taught in schools. The more you hear about the world, maybe from news programmes, documentaries, friends and work colleagues who’ve been to places you’ve never heard of (or are even originally from places you’ve never heard of), or novels/films, the more something you’d never previously considered might interest you. When I was 20, I had never heard of countries like Benin, and the idea of going to West Africa would have made me go ‘why would I want to do that?’, but over time I heard about them, read more about them, and realised that they had a lot to offer me. As a side note, of all the countries I’ve ever visited, just over 20% of them did not even exist when I was 15 years old. 3) You’re less likely to get Homesick or have Culture Shock. No matter how old you are, if you go somewhere new then there’s a chance you’ll stop in your tracks and be a little fazed by your surroundings. Things will surprise and confuse you, and it will take a little while to collect your bearings. However, being older means you have just that little bit more of that old clichéd expression ‘life experience’. No longer wide-eyed and acting like a rabbit in the headlights, you’re more used to the way people are, the way you yourself come across, and are able a little easier to take it all in your stride rather than being a little panicky. The concept of ‘self-confidence’ is bandied around – I’d say this is a slightly different concept; maybe ‘self-comfortableness’ (would that it were a word!) in that not only do you have the self-confidence to go out and explore somewhere new, but also the self-knowledge that you know it’s never going to be as strange as you might at first think. A sense that you’ve already seen what people are like in the ‘real world’, and in any case know more about the world in general, so whether it be in Barnsley or Barbados, Detroit or Dili, it’s not quite the unexpected chaos you imagine. 4) You’ll be afforded a greater respect. Probably. It does of course depends where you go and whether you’ve done the research beforehand. And while this of course depends very much on the individual, remember that stereotyping does exist. Many cultures of course afford respect to older people anyway – this is particularly prevalent in Asia and Africa. And additionally, for example locals know that thirtysomethings and beyond are less likely to climb mountains to post naked selfies of themselves on social media. Also, being an older traveller means that people won’t immediately jump on you and expect you to want them to take you to some random bar full of beered-up backpackers. The downside is they’ll still try to scam you, obviously; possibly more so because, being older, they’ll assume you have a bit more cash to hand. 5) You can still have fun! 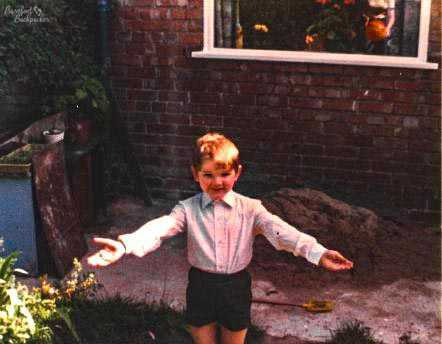 At the time of writing, this is the most recent pic of me – in the village of Eyam, Derbyshire. My earliest memory of older backpackers came on a group tour I did to China back in 2002. Most of us were early/mid twentysomethings from Europe and Oceania, however also on the trip were a married couple from Sweden, early 50s. They were fitter than most of the youngsters, joined in all the banter, had far geekier technology (I’d imagine a few years later they would have been among the first to travel-tweet and Instagram), and connected in general with the rest of us far better than you’d have imagined. They did tend to go to bed a little earlier than we did, but maybe they just knew that early starts were a ball-ache! Maybe that proves that age is merely a number and that how old you are is merely a state of mind. Or that Swedes, in general, are young-at-heart. Although nothing beats the story I read in a magazine article in a doctor’s waiting room in Australia, about the “World’s Oldest Backpacker”. He was happily travelling the world and staying in hostels at the age of 95. Will you still be backpacking when you’re a pensioner?! First off I love this post! Thank you so much for sharing it with this community. You bring up a lot of great points, which I think is good to articulate. Many forget or don’t think about these things. I also believe travel keeps you young. Not that age matters, but rather it is good to stay light and young at heart whether you’re 20 or 80. Some time after we returned home, I was trying to remember the name of the place we stayed at in Hampi, India. I did a rudimentary google search with a couple of things I remembered, and happened upon a, well, not exactly a blog, but a few posts by a woman who had stayed at the same guest house, just two weeks after us. I looked at her pictures, and was amazed to see that she was likely in her early seventies, with a husband who may have been close to 80. One fabulous picture of one or the both of them, sitting in a coracle, crossing the river near Anegundi. She included a photo of a young backpacker couple they were sharing the coracle with. I don’t think you’re ever too old to backpack, I guess, until you are, if that makes any sense. Love this. We took a mini break (6 weeks) at the beginning of the year to travel around Burma (technically Myanmar), Vietnam, Cambodia etc and I could not agree more with every point you make! I do find those twenty things to do in your twenties articles slightly annoying as there is almost a belief that you can only do these things when you are young. Having done it in my teens and now I can honestly say, the experience is just as good if not better as I don’t have to worry about whether I can afford that helicopter trip, (or whatever it might be). I do also recognise that we forties travellers are a much smaller group, and many people simply ‘feel’ they can’t do it but I believe anything is possible with the right mindset. Thoughtful points, Ian. We met a lovely couple in Pamplona who were in their early 70s hiking the Camino de Santiago. I was bit by the travel-bug as a child of 4, when the US Navy sent our family to Italy and have been traveling ever since. I spent my junior year abroad and 3 years in my early 20s traveling in South America and Asia. Later, I started dragging my husband with me and we’ve recently returned from an RTW with our teenage kids. We were inspired by the range of people living the traveling lifestyle… from empty-nesters like our friends The Oestings at http://www.Landsremote.com and the couple behind http://www.gypsynester.com/ to large families like the 15 members of @Largerfamily and teenagers like http://bookertravels.com/. There are a LOT of non-20s/30s on the road! Yes. I think the problem is that most people, by the time they’re in their 30s, if not before, have obligations that mean they can’t just pack up and travel– usually this involves marriages and/or children, but also sometimes jobs that can’t be left for long (even if they do have paid leave time available) or situations at home that can’t be left for long. And– we’ve had this conversation before– because this is seen as the “norm,” then it’s seen as “normal” for older people to not want to travel (do people stop wanting to? Or do they just not admit they want to anymore? Or do they tamp down the desire to and so convince themselves they don’t want to?). And then it’s seen as “abnormal” for older people, who have the means to do so, to travel.